These jackets are sold in chest sizes. We measured a selection of these jackets and found them to run larger than you’d expect judging by the stated size. We suggest you measure your chest and belly and use the chart we put together below to choose a jacket size based upon your measurements. Choose a size that will be big enough for both your chest and belly. The Dominator sports leather jacket is is a partially perfed leather sport jacket that comes complete with armor. It is a simple design primarily for sport/street riding. The leather used in this jacket is similar to other brands that make sport leather jackets. The finish is sort of “matte” finish. Most of the front is perforated and most of the arms too, so there will a good deal of air flow through the shell so this jacket will be comfortable in warm.. maybe even hot weather (depending upon your riding position and speed). The jacket comes with a removable vest-type thermal liner. You can use the vest in cooler weather. If you layer with your own gear underneath, you might be able to extend the comfort range into cold weather, but as it is, I’d say “cool” weather would be the limit. The armor is standard CE molded protectors in the shoulders and elbows and a foam back pad. All is removable. Its not “premium” armor but it is similar to what you get in all but the more expensive gear like REVIT and Alpinestars and is commensurate with the price point. And best of all you don’t have to buy anything else. 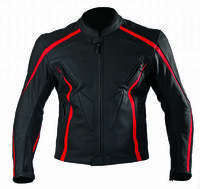 Motonation says: A great leather jacket for both sport and casual riding, the Dominator jacket features integrated padding in the chest and back areas, plus CE protectors in the elbows and shoulders. There are two hand warming pockets plus two internal storage pockets, along with perforated leather panels on the chest, arms and sides to bring in cooling air on hot days and, for cooler mornings, an insulated, removable quilted liner.